It's 4:45 a.m. and pitch black outside. We're disoriented from having just arrived in Siem Reap the afternoon before. We trudge out of bed, gather our things for the day and cross our fingers that the hotel has some fresh coffee brewing. Upon arrival, however, the open air lobby is also dark and we see the hotel staff wrapped in blankets, sleeping on the floor in the back room. Coffee is not in our immediate future. Around 5:15 a.m., Mr. Pheng, our tuk tuk driver, sleepily walks through the gate to tell us he's arrived. We jump into the tuk tuk and get whisked off to Angkor Archaeological Park. We aren't the only ones with the crazy idea to be in the park for sunrise. The road to Angkor is lined with tuk tuks beeping and passing each other, bike riders cycling with headlamps shining bright and the occasional car passing us all by. The ticket office is crowded with half asleep visitors and workers. Any attempt at organization is completely blown out the window at this hour in the morning. We get in the one-day pass line, get shuttled to the three-day pass line and take our pass pictures with eyes half open (someday you should ask Dave to show you his pass, I won't embarrass him by posting it here). Mr. Pheng drops us off at the temple's west entrance and points to a parking lot of tuk tuks 20 deep. "You will meet me over here when you are done. 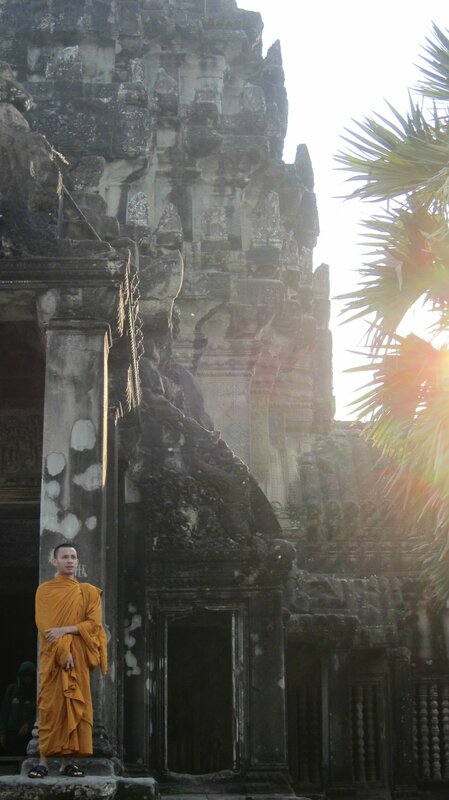 Maybe 9 o'clock after you see the sunset and walk around Angkor Wat?" Is he insane? There are close to 150 tuk tuks already parked and I'm assuming many more to come. "Okay, we'll look for you. Can I have your card again with your phone number just in case we need to call you?" I say as he ushers us to the temple. A coffee cart with blinking LED lights beckons us over and we grab lattes and join the parade of people into Angkor Wat. It's mostly quiet at this hour and the only real talking we hear is from the vendors roaming the lawn advertising their stall, "007!" for a post-sunrise breakfast. It's still pretty dark at 5:45 a.m. and we can't see much of Angkor Wat as we approach the main lawn where hundreds of our closest friends have already gathered. People are claiming seats everywhere - on top of temples, stone carvings and surrounding the small moat in front of Angkor. I look over to the right and see that hardly anyone is gathered on that side of the main walkway. Sure, there isn't much of a moat to reflect the sunrise, but it's just as beautiful. We head over to join only 20 of our closest friends for the sunrise view there. Escaping the crowds by sitting to the right of the walkway (the hoards of people gather to the left). The sun rises in the east behind Angkor Wat and the cloud colors change as the sun continues its ascent. Everyone is snapping pictures - iPhones, point and shoots, DLSRs on tripods - they're all being used at rapid speed. Just before the sun really hit the horizon, the sky lit up beautifully. We sit and drink our coffee as we continue watching the sky morph and change. After half an hour, we decide to head into the temples early to explore before the crowds swarm the entrance. Up the stairs, ducking through temple entryways, we find ourselves surrounded by stone carvings, Buddha statues and hallway after hallway leading through the complex. Dave keeps saying, "I can't believe they let us just walk on this stuff!" It is pretty amazing considering it was built in the 12th century and there are really no areas you can't explore. 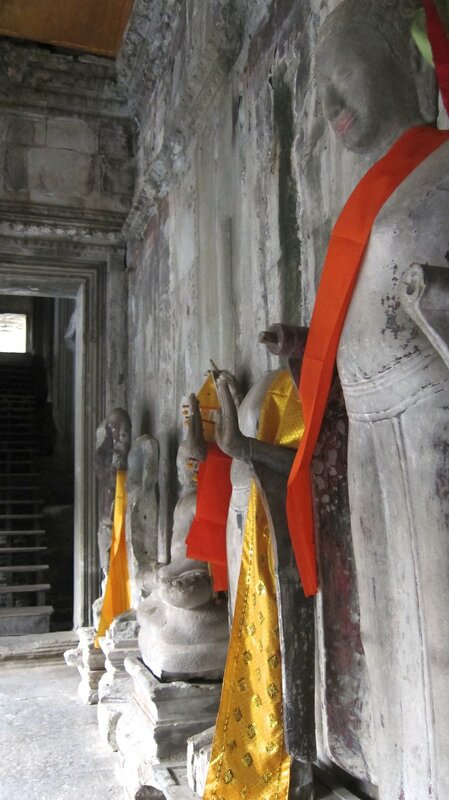 Statues covered in bright sashes line one of the entry ways into Angkor Wat. After winding our way through the main temple grounds, we find ourselves near the east entrance along the shores of a waterway. It's so serene and peaceful early in the morning and would have been the better, more secluded spot for the sunrise. An hour and a half later, we walk back through the temple complex and pass group after group entering the temple. I'm thankful we explored early and had many areas to ourselves. In an hour, that would be near impossible with the crowds. Back at the main entrance, a group of young monks in their saffron-colored robes are gathered. They are taking pictures of each other on the steps with camera phones. They look just as giddy as we did entering such a sacred place. A monk posing on the top stair for his friends at the entrance to Angkor Wat. Leaving the complex, we head to the parking lot in search of Mr. Pheng. Every tuk tuk looks the same and it's overwhelming to search through the rows. Luckily, Mr. Pheng spots us and comes running to get us. Morning crisis averted. All in all, it was a fantastic way to begin our experience at Angkor Wat. We began our experience at Angkor Wat, and ended it there the following day when we found ourselves with an hour to spare before heading to the airport. We asked our tuk tuk driver to take us back to Angkor so we could see the sunset. Our time was limited so we stopped at Angkor Wat again, which is one of the first temples after entering the park. This time our tuk tuk driver had fluorescent green seat covers so we were confident we'd find him among the throngs of other tuk tuks. The sun sets opposite Angkor so it was nowhere near as beautiful as the sunrise, but wandering around the grounds in such soft light was a calming and peaceful end to our trip. More people joined us at this hour so it was difficult to snap a picture without strangers lurking in the shadows. I felt satisfied with our quick, two-day tour of Angkor and was happy to leave the crowds behind. The sun goes down behind Angkor Wat and ends a day of temple discovery for the many tourists. We sat outside Angkor Wat and drank an Angkor beer to cap off a hot and tiring day of exploring. Would you have thought it would end any other way? Getting to the park for sunrise is absolutely worth it. While you won't have the place to yourself, it is the coolest time of day and the most peaceful for exploring. If you have the stamina, I would recommend getting to the park by 7 a.m. most days and leaving by lunchtime when it really starts to heat up. It's not hard to get off the beaten path if you walk the other way of the crowds. There really is no territory off limits in the main temple complexes so take the time to find your own sacred space. More to come in upcoming posts on the temples to avoid, and to visit, if you can't hang with the crowds. Even though it's going to sound good to drink a cold beer at the end of the day when you're hanging around Angkor Wat…it's probably not a great idea. Especially when sitting near a monk.